Focusing on innovation in public-private partnerships, this is the latest event using our fresh style of conferencing - short targeted seminars, roundtables, boardrooms and plenary sessions. 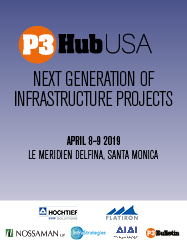 The conference agenda will be curated to share examples of best practice and look at current and next generation of infrastructure partnership models in the USA. Port of Miami Tunnel Concession Co.